Nose: Nice notes of biscuity malt come wafting up as I finish pouring and a little later some vanilla/butterscotch. Not much else; not surprising given the heat. Well, let’s give it some more air before adding water. Hmmm maybe some pine/wood spice and then some brown sugar. Much more sweetness on the nose after the first sip and the vanilla expands dramatically, picking some cream up as it goes. Water makes the vanilla even more intense if possible and there’s some aromatic lime peel in there too now plus definitely some pine. Palate: Nice, thick mouthfeel. Oddly, not particularly hot on the palate, but the flavours do seem very compressed. Malty sweetness and vanilla are really the only things that really register and the sweetness gets quite musky. Let’s see if water releases some fruit. Yes, it does, but it’s not the apples and pears of the official bottles but lime and a hint of banana. Water also draws out some polished wood (probably related to the banana note). The lime gets a little more pronounced with time and there’s a little more pepperiness too now. The vanilla sweetness never goes away and, frankly, becomes a little too cloying for my palate. Finish: Long’ish. Not terribly interesting, with nothing new showing up with water or without. Comments: This is very nice, but I was hoping for a little more fruit. The fruitiness of the OBs I’ve reviewed are what I liked best about them and I guess I thought this cask strength version would present more intense fruitiness and more tropical fruit notes. However, if you like intensely malty/vanilla-creamy whiskies this one will make you very happy. Thanks again to Alex S. for the sample! 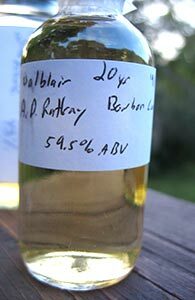 This entry was posted in -Whisky by Rating, 85-89 points, A.D. Rattray, Balblair, Whisky by Bottler. Bookmark the permalink. ← Balblair 1989-2010, 2nd Ed. Thanks for the review. That’s too bad about this whisky. I’ve been eyeing possibly buying an A.D. Rattray Balblair 19yr bourbon cask with a similar cask number as your sample, and I was hoping it would have the intense tropical fruits you mention. There’s also an A.D. Rattray Balblair 16yr sherry cask, but I was less interested in the sulfur, chocolate, and spice notes it’s likely to have. I was hoping for a cask strength version of something similar to the older official bottlings, but sounds like these aren’t that. Well, you never know. Another cask might well have that fruit in abundance. Given the fruit in the OBs, and given that most of those are (predominantly) bourbon cask it might be the case that this bottle is an aberration. And, of course, it might also be the case that this sample was poured late in the bottle’s life and so might not be truly representative. A note tonight from someone on WhiskyWhiskyWhisky who is drinking a bottle down suggests that tropical fruit does emerge as the bottle winds down.